Our original location in Magnolia is a bustling practice that has expanded over time. Dr. Cutbirth first opened the office in 1990. His wife Elizabeth ran the front desk, and our staff at that time was just one assistant and a part-time hygienist. Since then, we’ve grown to eight patient exam rooms and employ multiple hygienists, each with their own sterilization area. Our front desk team is always ready to get you signed in and help you in any way possible. 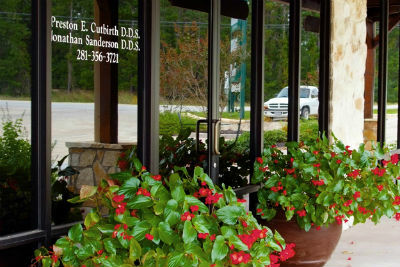 Dr. Cutbirth and Dr. Sanderson work at our Magnolia location. With several people on staff to accommodate you, we can see entire families during one appointment. Use your insurance coverage for your visits or set up a CareCredit® plan to get the dental care you need. Contact us today to book your appointment! Please note: Every 4th Friday of each month the office is closed. Our office is on FM 1774 which is also called South Magnolia Blvd. in Old Magnolia. We’re in the Magnolia Health and Wellness building next to the Church of Christ.